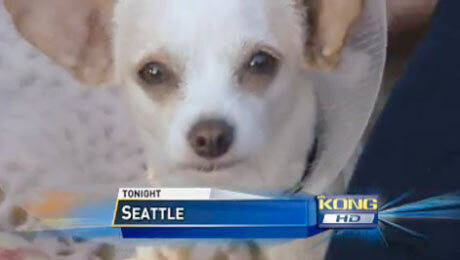 Pardon the interruption for this important news item: Ahem, Chihuahua – vs- Bear?!?!?!?!? Hey, Mickey! 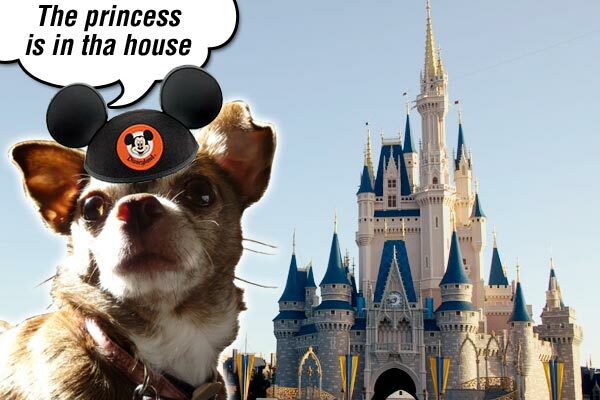 Can this Chihuahua get a Florida resident discount at Disney’s new pet resort? Ay, Chica, how did I miss this?!? I must have been napping! 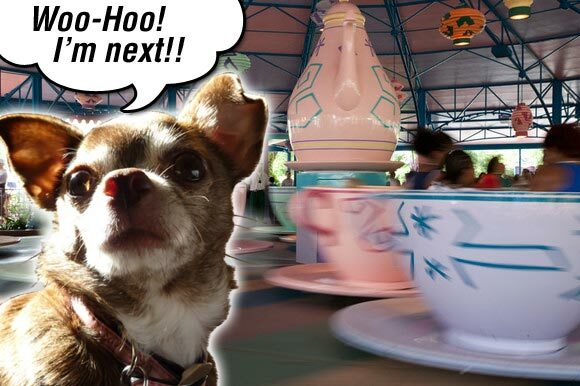 The folks at Disney announced the opening date for their new, awesome, even posh resort for visitors’ pets. My PRINCESS radar must have been off. Anything that includes POSH in the description has got Chanel written all over it. You know I’m there, baby! Beginning August 27, 2010, new Best Friends Pet Care Resort will offer accommodations – even air-conditioned – for special pooches like me and a few kitty-catos. 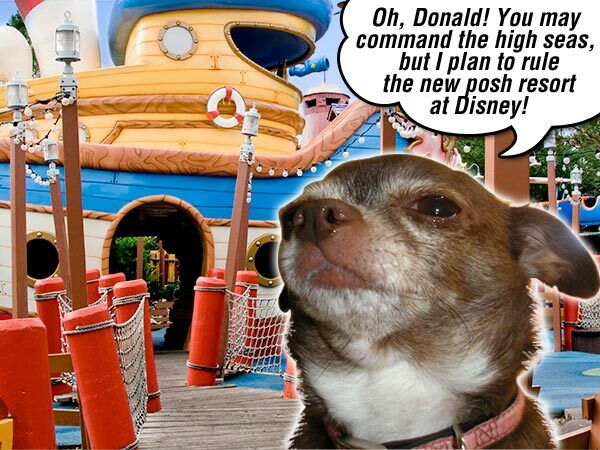 They’ll even have four “expansive VIP (very important pet) suites.” Who called ahead to tell them I’m coming? Naturally, these will offer television, raised bedding and private yards. Plus they’ll have ice cream treats, bottled water and orthopedic bedding. Only way to travel, Baby! Now I’m just collecting signatures to petition for massages, poolside pedi’s and live entertainment. Introducing myself to the celebs! You see the size of my castle?!?! Let’s face it, pawfriends, summer breaks give our humans too many weekend getaway ideas, and too many of those DO NOT include the Chihuahua. Now they can bring the whole family along. Check out the website, talk to your Mama, and let’s make it a date, chicas!! Rescue wear now also available for your humans!! And 15 percent goes to Rescue groups and Spay/Neuter programs nationwide. They also have a line with proceeds to help The Good Dog Foundation, a non-profit organization dedicated to all forms of animal assisted therapy. I like they way they are thinking. Plus the clothes are so cute! Everyone wants to be a cute dog even this very confused porcupine! So I must admit that swimming has never been a real delight for me. 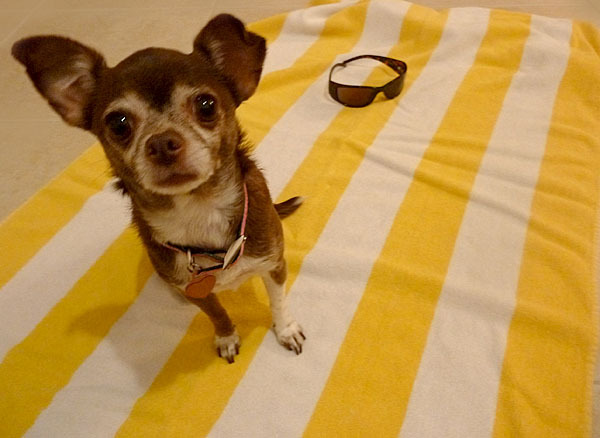 Though my petite, diminutive size makes me quite “floaty” I do have short legs and that makes for a whole lot of doggy paddling to get across the pool. Way too mucho work for this chica!!! I’d rather watch. I prefer to have my humans hold me while I splash in the cool, refreshing water. Then, when I get a little shivery, I’d rather relax sunning my shiny brown coat poolside with a drink and snack ready on hand. She does make it look like fun. Of course, for a treat I’d do anything too. But there is a little resemblance in our well-crafted, sleek build. Maybe if I learn to use my tail like she does I can get better and more fluid in the water. OK, don’t laugh. I know it is not much of a tail. Oh, well. It is summer and the weather is quite toasty here in Florida. It is worth a try as long as all these aquatic acrobatics don’t mess up my princess composure. I have an image to maintain! Another inspiring bathing beauty, Snooty the Manatee, turned 62 this weekend! Let’s wish him a Happy Birthday. 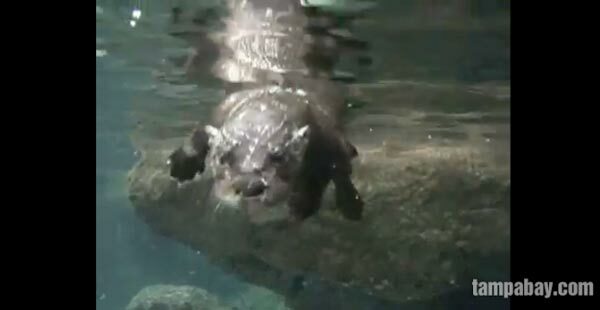 And finally, with this aquatic theme in mind, let’s keep our paws crossed and our happy thoughts strong in hopes that the oil spill containment efforts succeed. I hear rumblings about seeping, well pressure and officials disagreeing about what to do next with the “capped” well. Let’s just be careful, people!! We have a lot of work to do to clean up this mess. And the sooner ALL of the focus can be shifted to the recovery efforts the better! 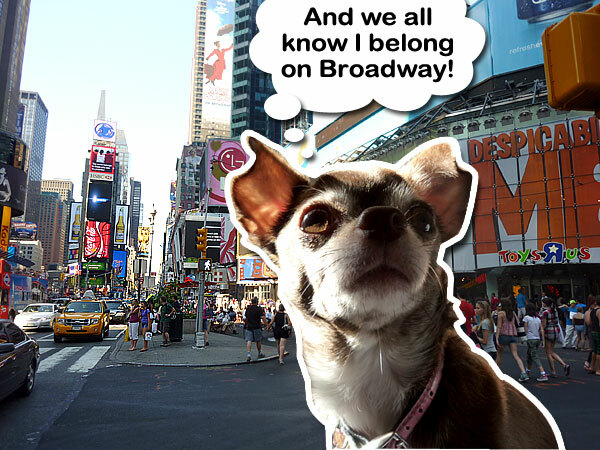 Mom found me a new paw pal during her recent trip to NYC. Meet my new buddy, Aspen. 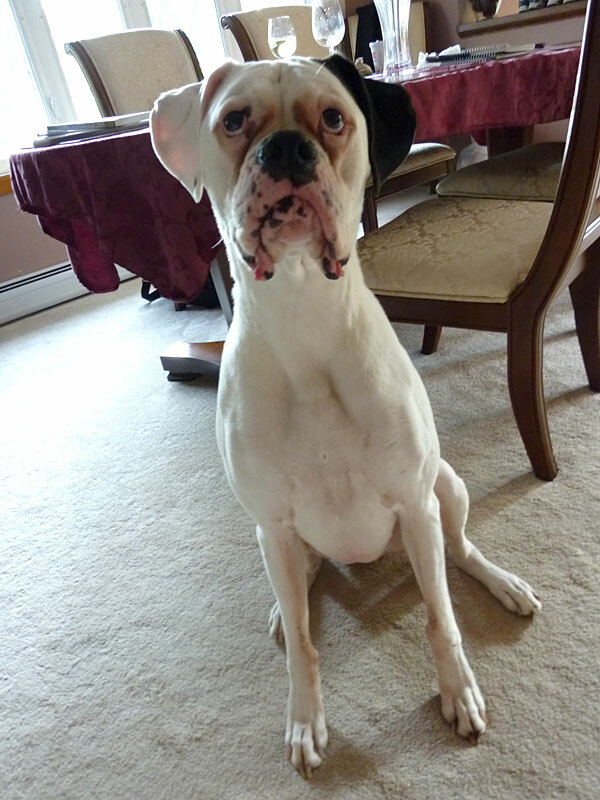 He is a handsome boxer who lives in the suburbs with his family – Mom’s friend Tracey (that would be Aspen’s Mama), Zack, (the little man of the house who would be Aspen’s human brother) and Jeff (the dad.) Aspen is 5 years old, but at heart he is forever a puppy. He loves to play with toys, particularly the stuffed and chewy kind. Aspen also seems to have no real concept of his large size. According to Mom, a sweet greeting from Aspen requires a bath soon thereafter – lots of big kisses and a large paw hug are inevitable. But then since I have no concept of my smallness either, as a friend, I can coach him a little on the social graces. Like I always say, survival among the humans is all about lithe, precision movement, quickness of the mind, and perfecting the craftiness of the “sneak and scrounge.” Of course, if all that fails, then it is about always looking innocent when you do knock something over or eat something you shouldn’t. And in case my angelic looks don’t cut it, I cast doubt in my gato’s direction. Works every time 😉 You can look all hurt by the “accusation” and point sadly at Zack. A heavy sigh coupled with that mug of yours it should do the trick! But back to the introductions. The more exciting news is that like my Mom, Aspen’s mom likes to write. And though Aspen and I won’t get much of a chance to play tug-a-stuffed-animal to pieces in “person,” I thought we could be awesome pen Amigos. So Aspen has agreed to be a contributor to my blog. I mean, the advice I have to offer IS invaluable, but I can that appreciate bigger dogs have their own challenges and approaches to the necessities in life. He can bring a lot to the table. Besides, he is awfully cute! I must apologize for the long gap, my friends. Mom went on her trip to New York City and I’m afraid in her absence it is a little tough for me to manage the laptop all on my own. But as soon as we got through our reunion last night (and I got tons of belly scratches to make up for lost time), I told her we’d need to catch up with everyone right away. So while Mom was away, I kept guard over the house. I maintained a faithful vigil for her return. 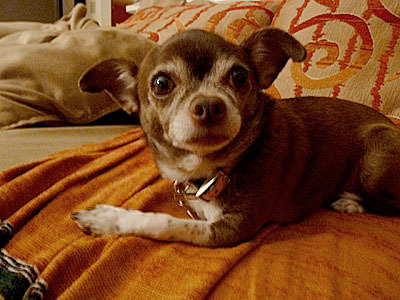 I was the model of dog perfection – constant, loyal, reliable … well, OK, mostly reliable. There may have been a few mishaps. Dad says I was acting up. But really, it was my big brother, Señor Gato who took advantage of the situation. Whoever said while the cat’s away the mice will play forgot to add that when Mom is away, the cat will scheme. Tigger kept terrorizing me when Dad was not looking. Like a good puppy, I’d try to get to my Potty Pads when I had to go and there was no one home to take me out. But the cat would just “happen” to be there, right between me and my pad, with that wicked menacing look on his face. I did not need my mind reading powers to figure out there were pouncing intentions behind those cold, calculating eyes. I waited as long as I could but sometimes there was an inevitable little mess. I tried to be discreet and hide. But Dad found out and didn’t buy my story. And the cat, well he just gloated at my distress. 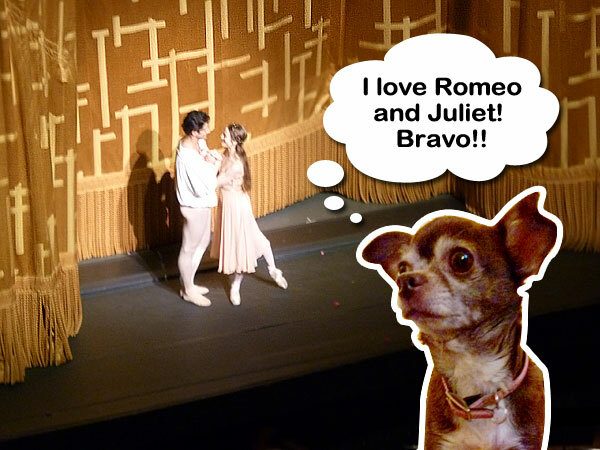 An evening at the Met! In any case, I’m glad Mom is home. And listen up, Mr. Cato! Things are back to normal around here and that means I’m the Princess in charge again!! Watch out, Meeeester! 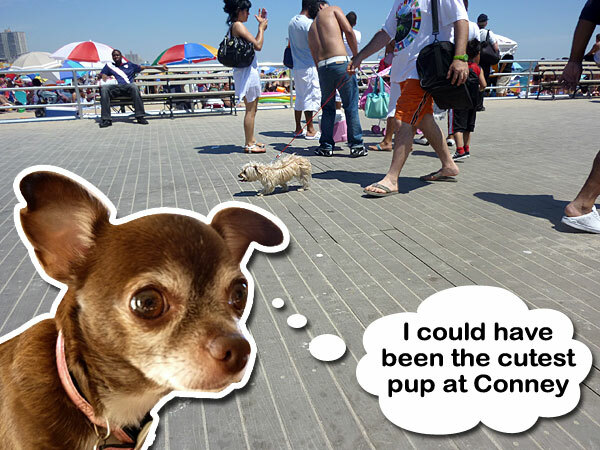 You are currently viewing the archives for July, 2010 at Chihuahua Wisdom Blog.